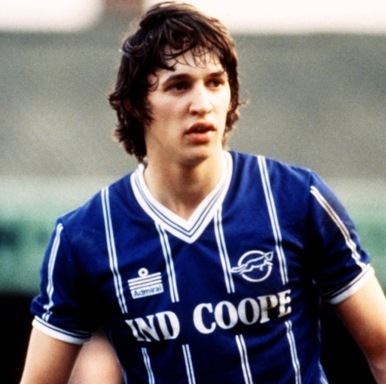 Lineker joined his home-town team, Leicester City, when he left school in 1977, aged 16. He went on to make almost 200 appearances for the Midlands club, scoring goals at a rate of almost one every two games. Mr Walkers Crisps’ fleetness (and opportunism in the six-yard box) helped the Foxes win promotion to the First Division in 1983. He didn’t struggle to make the step up: in 1984-85 he was the league’s top scorer, with 24 goals with (tied with Chelsea’s Kerry Dixon, btw). Of course, then it was inevitable that Lineker would be poached by a bigger club, and the season after he notched 24 goals, he moved to Everton (league champions at the time) for Â£800,000. Here, Pies celebrates Lineker’s time at Filbert Street with a photo gallery bound to make you weep hot tears of notalgia.